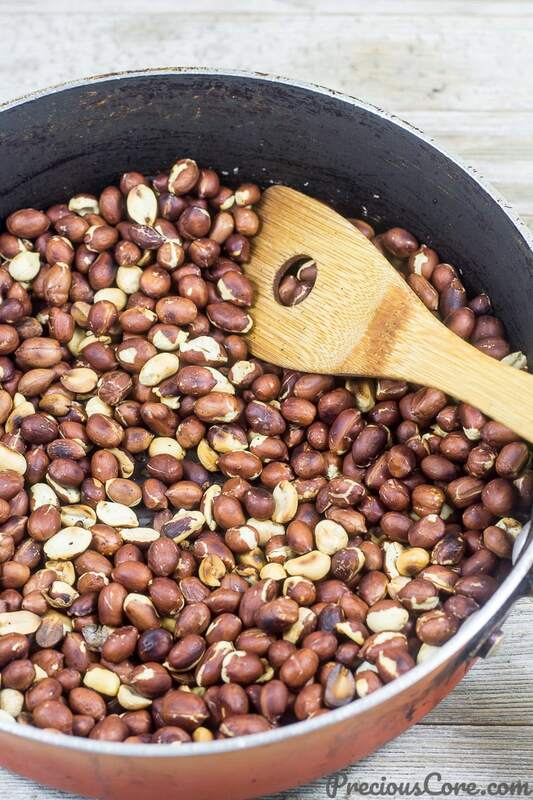 Cameroonian groundnut paste, also known as “Mboh” is a pudding-like savory meal made with roasted peanuts. 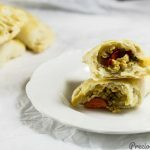 It is spicy, peanuty and insanely good! My mother is unarguably the best mother in the world! You need to hear how she tells me recipes over the phone. With so much passion! 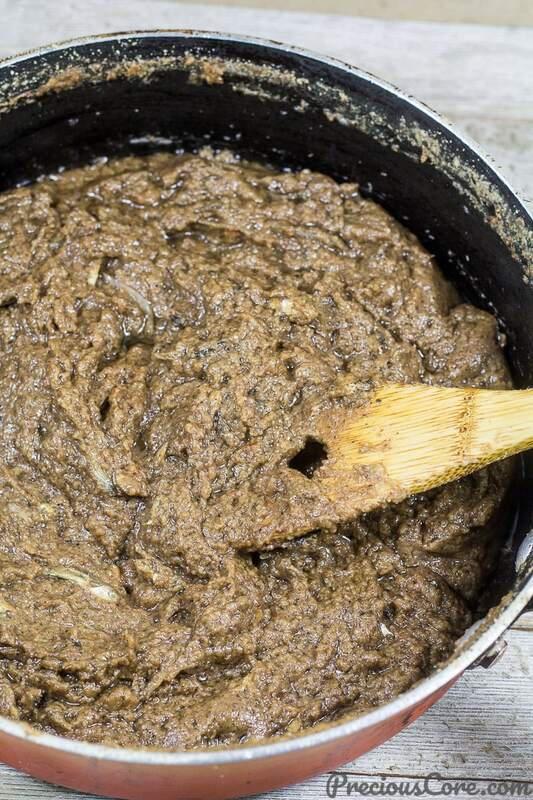 She taught me how to make this Cameroonian groundnut paste over the phone. I followed her instructions and it was a hit! Such that Mr. N said it reminded him of his grandma’s cooking. Whoop! 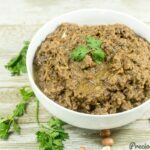 This groundnut paste is very similar to Cameroonian egusi pudding and they are both hawked on road-sides in Cameroon. Mboh can be eaten with any starchy side of choice – cassava (yuca roots), plantains or yams. I also like it in French bread. So good! Sometimes, it is eaten with some fresh garden eggs. Insanely good! In Cameroon, it is typically eaten with Bobolo or Miondo, a product of cassava, (yuca roots). I’ll be showing you how to make bobolo/miondo in the days ahead. But first, let’s make some insanely yummy mboh! I made a YouTube video to show you guys how to make this deliciousness. You can click here to subscribe to my YouTube channel so you never miss any of my videos. The stove-top method. With this method, the Mboh is made right on your cooker. I prefer this method because it is easier and the mboh is not too thick which makes it a great dip! You need 3 cups of raw peanuts (called groundnuts in Cameroon). You also need 1/2 cup of ground crayfish, 1 hot pepper, 1 crayfish seasoning cube (or 2 regular Maggi cubes), and some salt. 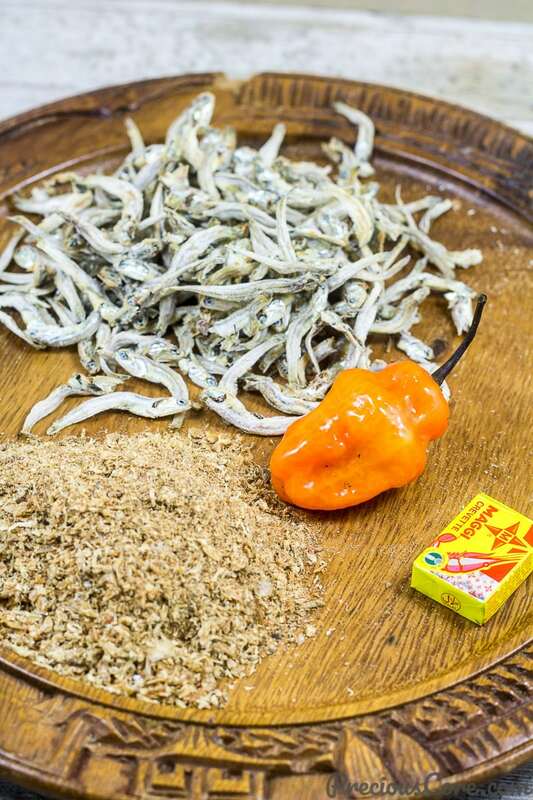 I added a cup of dried fish – anchovies known as “njanja moto” in Cameroon to mine but this is completely optional. Step 1: Roast the peanuts until they are very done. This takes about 15 minutes. Also, be sure to stir while roasting so the groundnuts do not burn. Step 2: Let the roasted peanuts cool completely then grind them. Also grind your hot pepper. Step 3: Boil together crayfish, fish with a cup of water. 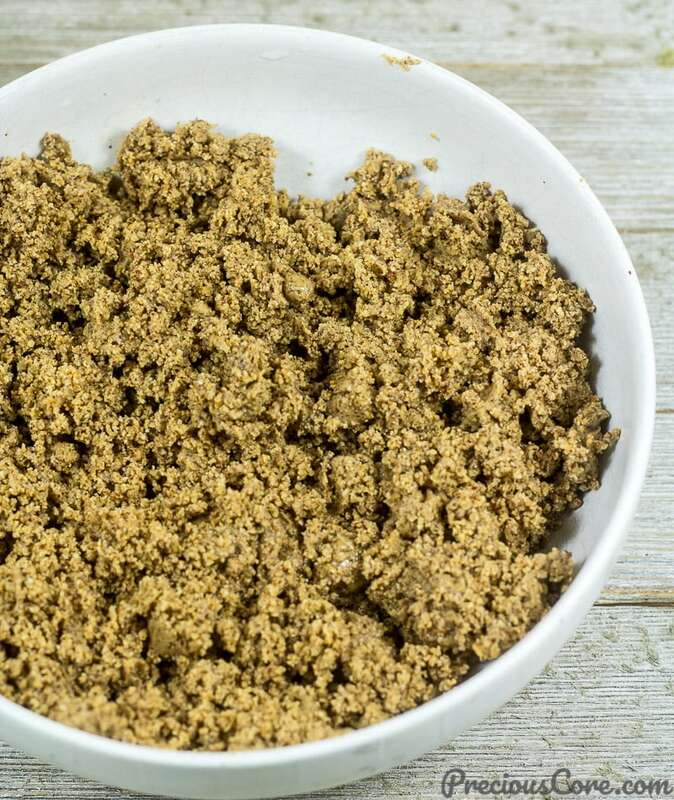 Mix ground groundnuts with 2 cups of water to form a paste. Add paste to pot. Add in Maggi, Salt and pepper and mix well. Cook on medium heat stirring all the time for about 15 minutes until the oil begins to separate from the peanuts. It is ready when a lot of oil can be seen hovering over the groundnut paste. Now serve that and enjoy with a side of choice. I had mine with some Bobolo! 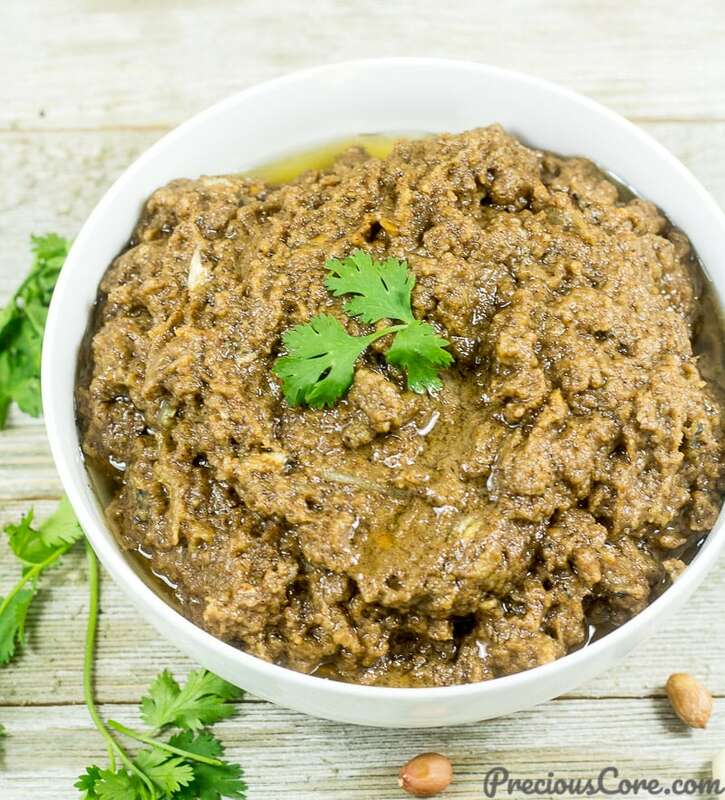 Cameroonian groundnut paste, also known as "Mboh" is a pudding-like savory meal made with roasted peanuts. 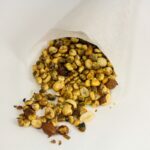 It is spicy, peanuty and insanely good! Place groundnuts in a wide frying pan or pot and roast on medium heat for about 15 minutes, stirring all the time. The groundnuts should turn brown - be careful not to let them burn. 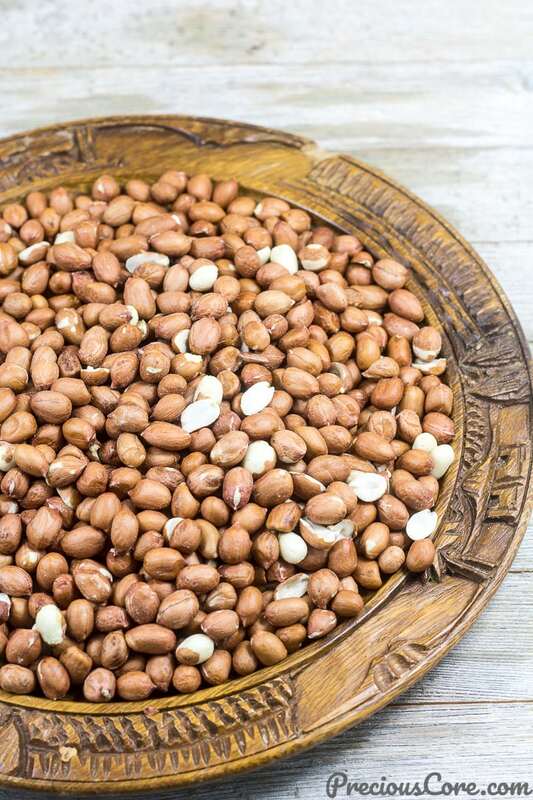 When groundnuts are fully roasted, place them on a tray to let them cool completely - for about 30 minutes. Blend together habanero pepper with about 2 tablespoons of water. Grind groundnuts using the small cup of your blender or a coffee grinder. Mix the ground groundnuts with about 1 cup and a half of water to make a paste. Place 1 cup of water, crayfish and dried fish in a pot. Bring to a boil. When water boils, add salt, Maggi, blended habanero pepper, and groundnut paste. Mix well then add remaining half cup of water. Bring the groundnut mixture to a boil, stirring all the time. 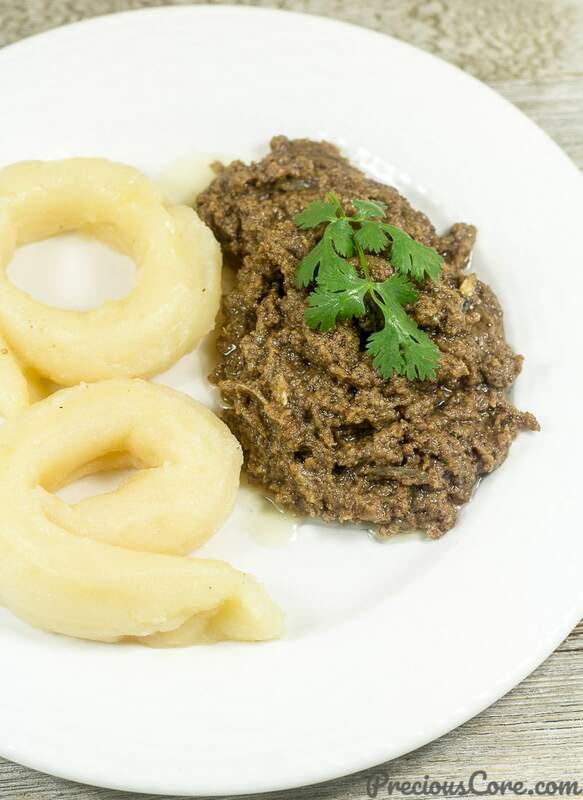 Let it cook until the natural oil from the groundnuts starts to show up and the mixture is considerably thick. Enjoy with any starchy side you like: bobolo/miondo (Cameroonian food made ut of cassava tubers), plantains, yams, potatoes or even bread! 1. 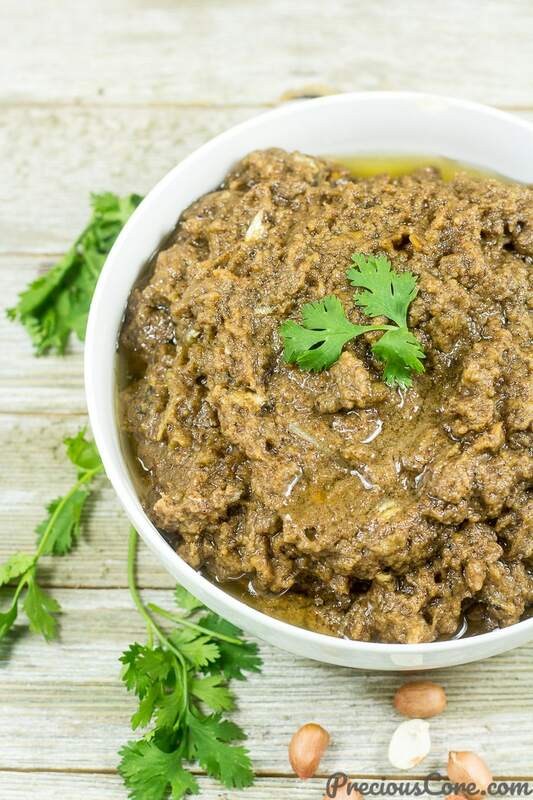 To cook your groundnut paste using the steaming method, mix all ingredients with 2 cups of water then wrap in banana leaves and steam till done. 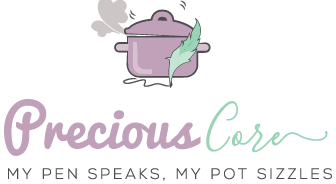 This is very similar to the way you will cook koki (steamed black-eyed peas pudding). Half a small onion - ground together with pepper and added to the mixture. 1 pebe (African nutmeg) ground together with the groundnuts. Half a teaspoon of "bush pepper" also know as peppercorns. Half a teaspoon of white pepper. 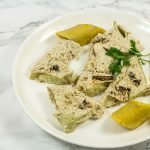 If you make this recipe, please share a photo on Instagram and tag me: @preciouscore, or share a photo on my Facebook page. I’ll love to see! Update: A lot of you have asked me where I bought the machine used in grinding the groundnuts in my video. I have included a link (affiliate link) below to the exact machine I used so you can equally get if from Amazon. I would love to try this recipe. Could you please send me a link on amazon for the grinding machine. I saw so many different types, not sure which to buy. Please send me the link on the one you are using or give the name and model for me to search on amazon. Thanks a lot. Hi Kelsey, I have updated the post to include a link to the exact machine I purchased. Please check the very end of the post for the link. 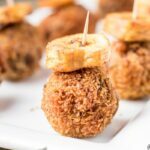 Was looking for a mboh recipe on your blog a few weeks ago, and voila!!! You delivered. Thanks sis. How long can this keep in the fridge? And lastly, you mentioned using less water if cooking mboh in leaves. So what amount do you suggest? Thanks for bringing joy to our kitchens. Hi sis, the machine is called a “corn grinder” on Amazon. Please check my update at the very end of the post for a direct link to the machine. I hardly ever keep it for long because it finishes fast. 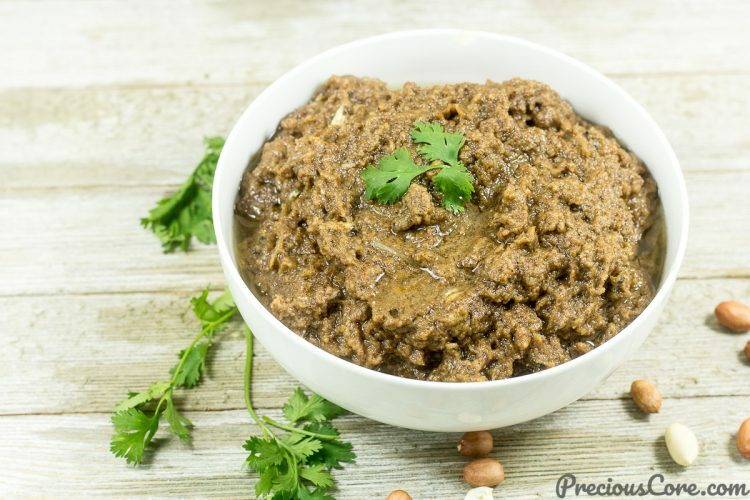 By I think it can last for more than a week – especially if there’s enough oil over the groundnut paste. I see you put a lot of effort into your blog. I see it. And it’s beautiful to behold. Well-done mum Precious. Keep up the good work. Thanks so much dear Am aka! So glad to read from you. 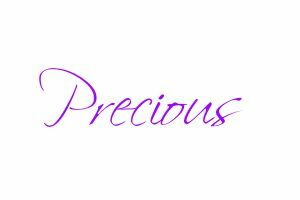 Thanks so much Precious. You are a wonderful person ready to share just all. May God bless your generous heart. I have been meaning to write a comment for a very long while but never got to do so. Set out cooking ‘mboh’ yesterday but got the peanuts burned and then abandoned the venture. I guess I will do better today with your help. Thanks again! Honestly Precious, I’m sold out with Cameroonian foods. My God! your country is blessed with different delicacies. I have eaten groundnut soup too many times but this Mboh, I have never heard of it until now. I will be glad to refer to this recipe any time I want to try it out. Thanks for introducing something new to me. Hi Honorine, I plan on doing a video on how to make bobolo soon. Look out for it. This sounds so delicious! I love to try completely new recipes but I’ve no idea where I’d get the crayfish from. I’ll just have to imagine it. Awww, thank you so much, Corina! If there’s an African store near where you live, you could get crayfish from there. If not, trust me your groundnut paste will still taste very good without crayfish. Please let me know how it goes if you try it.